Do You Have a Loved One with Alzheimer’s disease, Dementia or Memory Loss? Our Wilmington, Delaware, firm focuses exclusively on elder law and we have extensive experience helping people with Alzheimer’s and their families make difficult but sound decisions. Whether you are the spouse or child of someone you now realize needs full-time care, or you are a senior who has been diagnosed with Alzheimer’s disease, we want to help. Talking about Alzheimer’s or the need for full-time care is not easy. Above all other considerations, we treat our clients with patience, compassion and respect. Our lawyers and staff are familiar with Alzheimer’s medication, progression of the disease, and the resources available to help you and your family. We also work with many individuals coping with Parkinson’s disease and other debilitating conditions. We are here for seniors and their families throughout Delaware. If you are in crisis mode, The Levinson Firm, LLC can provide calm, resourceful guidance to help you develop a clear plan for the future. 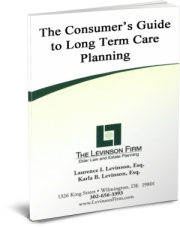 The Levinson Firm, LLC takes pride in our ability to apply current, specialized asset protection strategies and tools many other elder law attorneys do not yet understand or provide. For caring, rational help in an extremely difficult time, we encourage you to contact us at the office of The Levinson Firm, LLC. We understand the challenges associated with Alzheimer’s disease and planning for the future.